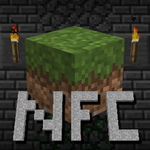 3: Drag over the OptiFine files to the NFC jar AFTER deleting cv.class from OptiFine's files, NOT NFC's. If you get a game crash, you did something wrong. Reset the jar and follow these steps again. Works absolutely fantastic. Thank you! I was wanting to play but the heartbeat stutter every 2 seconds was immensely annoying. Now I can crank it to every 30 minutes so I am fine!